As sweet as cinnamon: Easy Peasy Baby Quilt Finished! 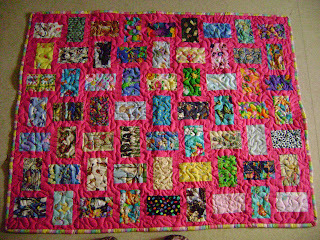 Easy Peasy Baby Quilt Finished! I have had a good run this week with time and finished another baby quilt for a friend of mine. I Have really enjoyed this one and love the bright colors in it. The blocks are easy to do and comes together quite easily. Cut 63 blocks of fabric 3 1/2" x 5 1/2". Cut 126 strips of homespun 1 1/2" x 5 1/2"
Alternate the blocks, 1 horizontal, 1 vertical, making rows so to have 7 across and 9 down. 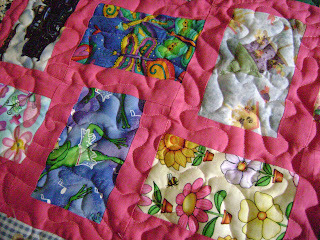 Sew together and add a 1 1/2" border all around. 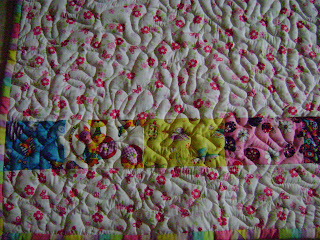 Back with a cute fabric and I added a few of the spare 3 1/2" x 5 1/2" blocks in a strip for effect. Quilt either in the ditch or stipple all over. There you have it. Easy Peasy. I will be back tomorrow with some pictures of another project that I finished but can't show until the recipient has received it as she reads this blog. Well how cute is that!! Chocolate Doris and Lemon Delight!